Mumbai: Publicly traded Indian companies are set to raise the lowest amount in five years through the so-called qualified institutional placement (QIP) route, with only Rs4,480.5 crore raised so far this year. 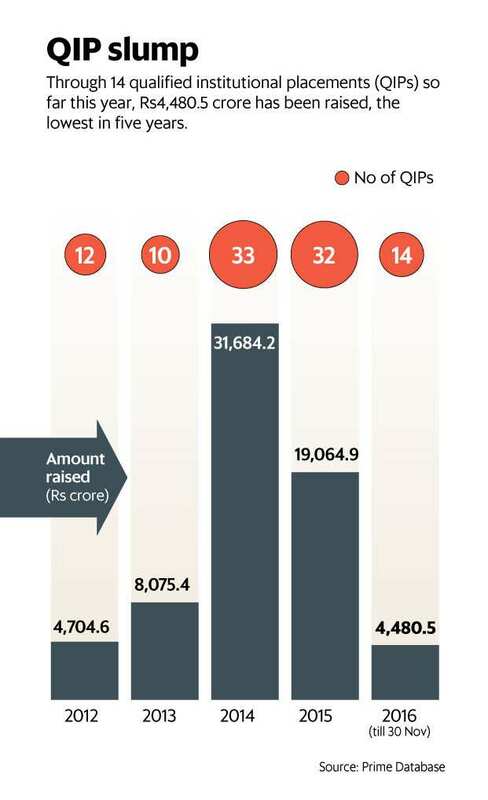 In contrast, Rs31,684.2 crore and Rs19,064.9 crore was raised through QIPs in 2014 and 2015 respectively, data from primary market tracker Prime Database shows. In QIPs, listed companies sell shares, fully and partly convertible debentures, or any securities other than warrants that are convertible into equity shares, to an institutional buyer. The drop in QIPs comes in a year when companies have raised Rs25,163.3 crore through initial public offerings (IPOs), the highest in six years. The largest QIP this year was auto parts maker Motherson Sumi Systems Ltd’s Rs1,993 crore sale in September. “QIP is essentially a bull market product, which is used by companies to raise additional fresh capital, at good valuations. We have seen that most of the year has been fairly turbulent with various developments both domestically and internationally. That has led to less number of QIPs and less amount of money being raised," said Pranav Haldea, managing director at Prime Database group. Since the beginning of the year, the benchmark Sensex has gained just 0.46%, compared to a jump of 29.9% in 2014, which saw QIP issuances amounting to Rs31,684.2 crore. One of the reasons for lower activity in the QIP market is the absence of capital-intensive sectors such as infrastructure, power and real estate, where capital-raising tends to be in large sizes. QIP activity in 2014 was driven by these sectors. Companies such as Reliance Communications Ltd, GMR Enterprises Ltd, Jaiprakash Associates Ltd and other infra companies raised large sums through this route, primarily to deleverage their balance sheet. But in recent times, these sectors have been missing in action. “The capex cycle is still to recover. If one looks at the IPOs, most companies have raised money to give exit to the investors and not to fund the business. QIP as an instrument does not lend itself to that kind of a transaction," said Munish Aggarwal, director at investment bank Equirus Capital Pvt. Ltd.
Investors have also become more cautious of infrastructure companies. “The view was that the recovery post 2014 elections will be sharp. However, the recovery has been much more gradual. As a result, people who invested in that cycle betting on a fast recovery have lost money. Hence, there is an disenchantment in infra and debt reduction as a possible use of proceeds," said Aggarwal. The low activity in the QIP market has also concerned the markets regulator Securities and Exchange Board of India (Sebi). In August, Mint reported that concerned by the drought in QIP activity, Sebi had called a meeting with investment banks to discuss measures to facilitate more activity in QIPs. Experts say the market could see stronger action, though in the short term, factors such as demonetization are expected to be a concern. “Demonetization aside, and assuming that the impact will be lasting only for a quarter or quarter and a half, things are looking up for the economy. Consumption is expected to pick up. That’s when we will again see companies come to the market to raise money. It is a function of the growth cycle continuing, going ahead," said Haldea.